GRAND RAPIDS, Mich. – Kicking off the first of four companywide retail fundraising campaigns in 2017, the SpartanNash Foundation invites store guests to join them in supporting local Habitat for Humanity affiliates in eight states. The retail scan campaign to provide shelter – one of the Foundation’s missions – begins on Feb. 8 and will run through Feb. 19. During the 12-day span, store guests who visit any participating SpartanNash-owned retail store or fuel center in eight states will have the opportunity to donate $1, $5 or $10 at any checkout lane. When store guests make a donation to support their local Habitat for Humanity affiliate, they will receive four coupons toward Spartan® or Our Family® brand products. Seventy-nine local Habitat for Humanity affiliates will receive monetary support thanks to the scan to provide shelter, with many SpartanNash stores teaming up to support the same chapter in their area. 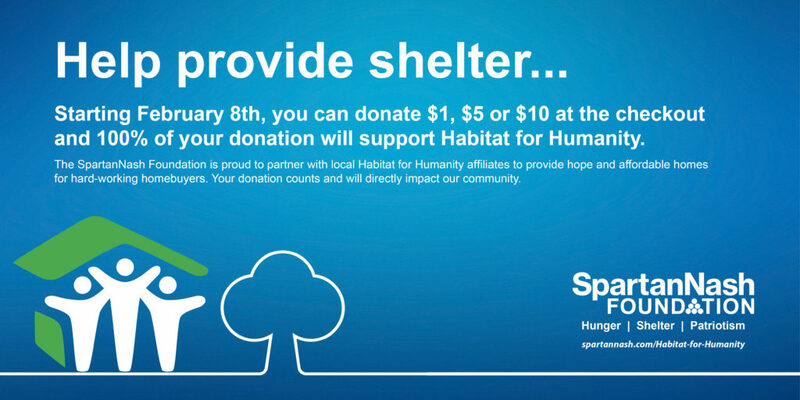 For a complete list of stores participating in the companywide scan campaign and the Habitat affiliates they will partner with, visit: spartannash.com/Habitat-for-Humanity. “The SpartanNash Foundation is our company’s charitable giving arm, supporting community nonprofit organizations that provide hunger relief, secure shelter and support our military heroes,” said Meredith Gremel, vice president of corporate affairs and communications and executive director of the SpartanNash Foundation. “Through our retail scan campaigns, we have developed many strong partnerships with local Habitat for Humanity affiliates, and, in partnership with our store guests and associates, we are excited to continue to support them in 2017. One hundred percent of all funds raised during the scan campaign to provide shelter will go directly to local Habitat for Humanity affiliates. SpartanNash underwrites the costs to run the scan campaign, contributes funding and encourages associates to volunteer with the local Habitat for Humanity affiliate. At SpartanNash stores with yes Rewards – including Family Fare Supermarkets, Family Fresh Markets, D&W Fresh Markets and VG’s locations in Iowa, Michigan, Minnesota, Nebraska, North Dakota and Wisconsin – the ‘thank you coupons’ will be automatically loaded onto the customer’s yes Account. The new feature will make it easier for yes Loyalty members to redeem scan campaign coupons and minimize the Foundation scans’ environmental impact by reducing the number of printed coupons. The SpartanNash Foundation has executed two previous retail scan campaigns to benefit Habitat for Humanity partners, raising nearly $250,000 in 2015 and 2016. Prior to the Spartan Stores-Nash Finch merger in November 2013, Spartan Stores conducted retail scans in its more than 90 Michigan stores to support local Habitat affiliates. Since 2006, more than $1.3 million has been raised to build hope and affordable housing for hardworking Habitat homebuyers. In 2016, nearly $825,000 was granted through the SpartanNash Foundation’s companywide scan campaigns, benefitting local Habitat for Humanity, Special Olympics, patriotic and food pantry partners. SpartanNash (Nasdaq: SPTN) is a Fortune 400 company whose core businesses include distributing grocery products to independent grocery retailers, national accounts, its corporate-owned retail stores and U.S. military commissaries. SpartanNash serves customer locations in 47 states and the District of Columbia, Europe, Cuba, Puerto Rico, Bahrain and Egypt. SpartanNash currently operates 157 supermarkets, primarily under the banners of Family Fare Supermarkets, Family Fresh Market, D&W Fresh Market and SunMart. Through its MDV military division, SpartanNash is the leading distributor of grocery products to military commissaries in the United States.